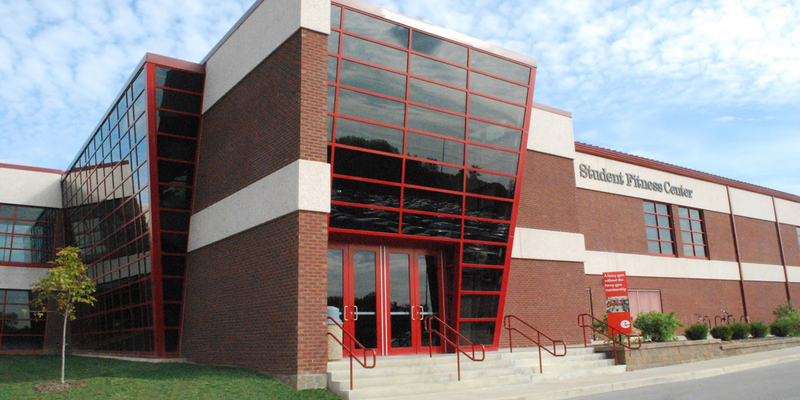 The Student Fitness Center has a comprehensive set of fitness and strength offerings available throughout the SFC and its satellite facilities, in addition to a dedicated Weight Room. 70 cardio machines, to include treadmills, ellipticals, bikes, rowers and more from brands that include Life Fitness®, Precor®, Cybex®, TRUE®, Matrix®, Free Motion®, SCIFIT® and Keiser®. Specialty training equipment like TRX bands, a lateral trainer, arm ergometer, stability balls, kettleballs, medicine balls, foam rollers, resistance bands, and more. Two group fitness rooms that primarily host group fitness classes but also welcome drop in use anytime they are not reserved for classes or other activities. An indoor cycle zone that hosts our group cycling classes. Any of the 25 Keiser M3 bikes with smooth magnetic resistance adjustments can also be used by anyone when the room is not reserved for a class. Two group activity rooms include speed punching bags, heavy bags, pull up bars, padded mats for stretching or individual yoga and one has a spring padded floor good for tumbling, stunting, martial arts practice and other activities. Equipment orientations are free and can provide users with an equipment tour. Learn how to adjust and use strength and cardio equipment in our fitness and strength areas. Fitness attendants can provide an equipment orientation upon request. *Equipment orientations are specific to our Fitness and Strength rooms and do not include coverage of free weight equipment. Questions beyond general setup and use may be directed to a personal trainer. Supplemental fitness equipment is also available for checkout or purchase from the Equipment Issue service counter. Examples include agility ladder, weight belts, boxing gloves, jump ropes, wrist straps, athletic tape, weight lifting gloves and much more.